Novelty Teddy Bear Glass Jar complete with lid. The glass honey bunnies are adorable. They were well packed and arrived safely. Good quality too.thanks. Bought on EBay. I found exactly what I wanted and your delivery was very prompt I wont hesitate to recommend you. I love the teddy bear jar I bought and am saving up for a few things you have in your store, am into preserving, making jams, sauces etc. and am thinking seriously about having a go at cheese making and would also like to keep chooks so you have many things I’ll be needing as time goes by. 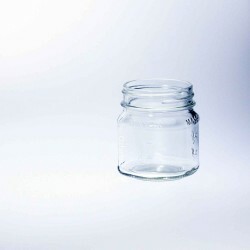 Cute 280ml capacity jar in shape of a teddy bear complete with gold twist top lid and yellow cap. Jar is glass, lid is a metal twist top and the yellow hat on the bear is plastic. Sold each or in a pack of 8. Fill up with jelly beans as a gift idea or use as a novelty candle.